Have you ever packed up your favorite perfume bottle for a big trip and had it break or spill in your suitcase or even get confiscated by TSA at airport security? Sarah Johnson, the founder of Perfumies, was frustrated that her fragrances were simply not made for travel. She set out to develop a product for girls like herself who were always on the go and wanting to smell pretty. The end result was Perfumies, a solid perfume stick that is changing the way the world wears and carries perfume. The compact size makes them airport travel approved, but also perfect to throw in a purse or gym bag for use throughout the day. All natural base, paraben free, with no preservaties, Perfumies come in fun scents that have hints of grapefruit, strawberries, vanilla, and orchid. The slender and elegant tube allows you to discreetly dab deliciousness on your wrists, neck, or cleavage without sticky fingers. 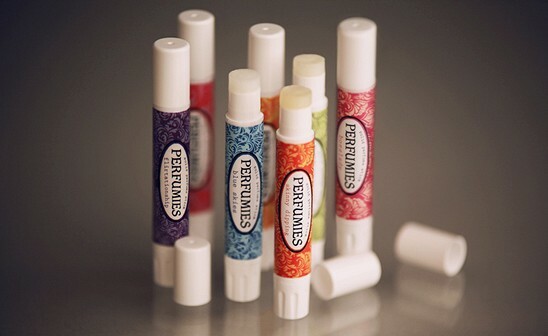 Carry them in your change purse or back pocket and you'll never be caught smelling anything but lovely. Have you ever packed up your favorite perfume bottle for a big trip and had it break or spill in your suitcase or even get confiscated by TSA at airport security? 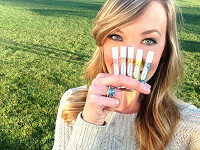 Sarah Johnson, the founder of Perfumies, was frustrated that her fragrances were simply not made for travel. She set out to develop a product for girls like herself who were always on the go and wanting to smell pretty. The end result was Perfumies, a solid perfume stick that is changing the way the world wears and carries perfume. The compact size makes them airport travel approved, but also perfect to throw in a purse or gym bag for use throughout the day. All natural base, paraben free, with no preservaties, Perfumies come in fun scents that have hints of grapefruit, strawberries, vanilla, and orchid. The slender and elegant tube allows you to discreetly dab deliciousness on your wrists, neck, or cleavage without sticky fingers.